One of the most famous Neolithic /Bronze Age sites in the world. Not the largest, nearby Avebury has that honour. This being such a famous site there are naturally several organisations involved in its conservation. 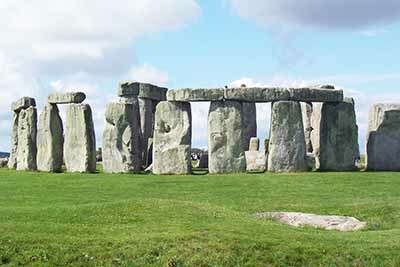 The National Trust own the landscape around and English Heritage run the site, but the Crown actually owns Stonehenge. From 1986 it became a World Heritage Site, along with the landscape around, the Avenue, the Cursus, Durrington Walls, Woodhenge, and what the World Heritage site describes accurately as "the densest concentration of burial mounds in Britain". This was an important and significant place. All are connected and part of the ancient Bronze/Neolithic ceremonial culture. Needless to say it is also protected as a Scheduled Ancient Monument. This means that legally no one can change it. Mystic, massive circles of standing stones which line up with the rising sun on the midsummer solstice. The site started as a circular bank and ditch with burial mounds around 3000 years ago. There are actually also signs of activity getting on for 8000 years ago! The stones themselves were brought to the site, dressed, fashioned and erected in what is possibly a double ring. The large stones are Sarsen, a local sandstone block. What they were for is also still open to conjecture – ritual or religious site the most likely scenario. With so much work it has to have been of major importance. Even allowing for its significance as a burial site. To have lined up with the solstice suggests mathematical skill as well as construction skill, yet these people had no written language. Mind blowing! Or you may perhaps wish to peruse the site some more. If so please use one of the navigation buttons on the left. Another Henge has been found on the prehistoric landscape at Durrington Walls. Around 100 large stones like those at Stonehenge and Avebury were found by archaeologists using cutting age technology, The stones were under a large bank. At the moment it looks as though those incredible prehistoric people pushed the stones over and built the bank over them. Obviously no longer needed! The find seems to be putting the site in a new light. 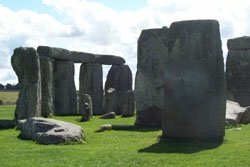 The landscape from Stonehenge to Avebury is full of prehistoric sites that were at one time extremely important to the local people. Now run by the National Trust. Go by Open Top Bus! Take the Stonehenge Tour. This takes passengers on a tour that visits not only Stonehenge but Old Sarum as well. You can get a ticket for Stonehenge with your bus ticket. Or just buy the bus ticket and enjoy the ride round. It is a good idea to get your Stonehenge ticket at the same time, saves waiting in the queue and they can get long in the summer. Opening times for the monument vary with the season and can be found here. For the landscape around - dawn to dusk. Plenty of hotels in Salisbury. All sizes all types.